I have one of those awkward bodies where my middle is small and a** is HUGE. These leggings are amazing quality, fit perfectly and are so cute! They’re durable enough to wear to the gym, and comfy enough to lounge around in. Best part, when I get board of one style, another is on the way in a month. Cannot say enough good about this company! Very Cute & So Comfortable!! I absolutely LOVE my leggings!! They're skulls & that's like my favorite design! They also feel so amazing!! They're so smooth & comfortable!! They also fit me perfectly!! I live in Oklahoma & the fleece/cotton material is perfect for an Okie!! Thank you Peach Bottom!! Got my first box as a gift and she LOVED it! Told me she is going to gift it to all of their friends too! Brand new to the club, love their staff! Had a few questions and they responded within 15 minutes of each email I sent! Their leggings are SUPER cute and can't wait for months to come! My girlfriend is a leggings fanatic! Peach Bottom delivered her an awesome pair of leggings that were unique and fun! She loved them and the fleece lining is great for Oklahoma mornings.This subscription is just what I needed to show her that she's number one! 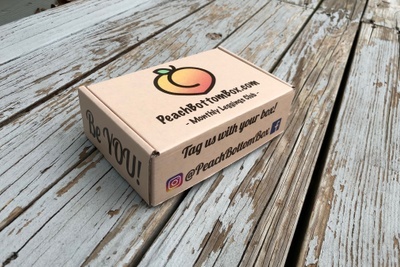 Thanks, Peach Bottom! You made me a rockstar!